I drink wine & abuse my Xanax when things get stressful. Can you help? Why is it so Effective? I just got my third DUI, and my wife left me and took the kids. Sometimes the only way I feel I can get by, is to drink. I drink wine and sometimes abuse my xanax when things get too stressful– but I’m exhausted. Does the Freedom Model help with situations like mine? The idea that drugs, such as alcohol, marijuana, and heroin, provide relief from emotional pain might be one of the most dangerous myths ever. Many self-described addicts and alcoholics truly believe they need substances to relieve their emotional pain, such as stress, anxiety, depression, anger, and trauma. This belief results in increased desire and a firm belief that there is no chance of ever quitting or moderating their use of substances. And it’s all for naught since the drugs never relieve the emotional pain, not even temporarily, and may even become the source of increased stress and upset as their use takes a toll on your life. Alcohol and drugs never relieve emotional pain, not even temporarily. If you think that substances help you with emotional pain in any way, it’s imperative that you read this chapter and learn that this effect is fully an illusion. It’s a placebo effect. While it is true that people report that drinking relieves their emotional pain, the drug alcohol itself does not pharmacologically relieve emotional pain. This is an important distinction. Drinking is an activity approached with certain expectations and intentions—a mindset. When drinking, many people give themselves permission to forget their troubles, and their friends and family may give them a pass while drinking as well. This is all to say that drinking involves much more than the drug alcohol. The ritual of drinking may relieve stress while alcohol itself does not relieve stress. 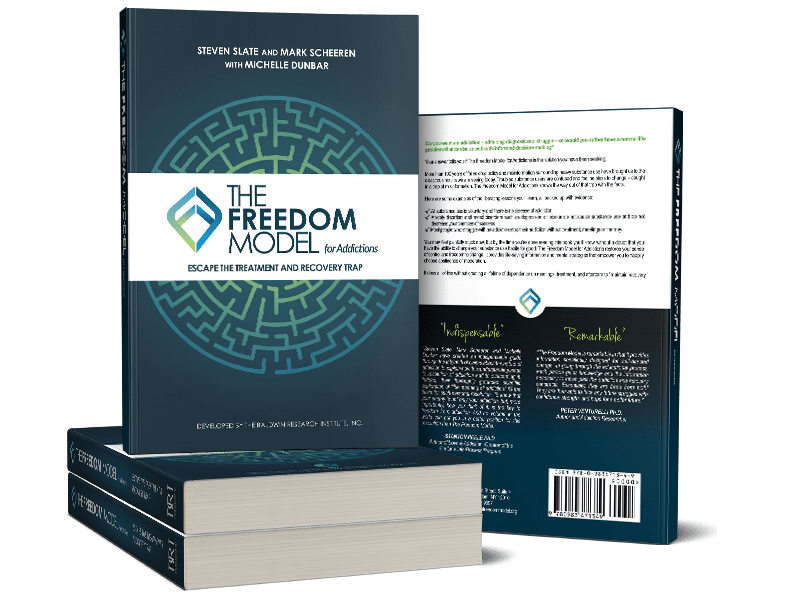 What is The Freedom Model? Who is the Freedom Model For? *In cases of physical withdrawal, medical treatment and/or medical detoxification services may be necessary. Consult with a licensed physician.. The Freedom Model and the Freedom Model Retreats, divisions of Baldwin Research Institute, Inc., do not provide any services that require certification by New York State’s Office of Alcoholism and Substance Abuse Services. The information in this book is designed to provide information and education on the subject of substance use and human behavior. This book is not meant to be used, nor should it be used, to diagnose or treat any associated condition. The publisher and authors are not responsible for any consequences from any treatment, action, application, or preparation, by any person or to any person reading or following the information in this book. The publisher has put forth its best efforts in preparing and arranging this. The information provided herein is provided “as is” and you read and use this information at your own risk. The publisher and authors disclaim any liabilities for any loss of profit or commercial or personal damages resulting from the use of the information contained in this book.